I owe it all, I’m afraid, to Jack Benny. It was in discussion with a 30-something that I learned that the 1950’s had officially died. Taking leave, Leave it to Beaver! Growing up 50’s, Beaver, I measured my life against yours and consistently found it wanting. You got in and out of trouble in 30 minutes, learned well your parental lessons, and made life within the confines of a picket fence look copacetic and cool. But as I leave, Beav, please do me one favor: tell Ward and June to stop dressing for dinner, for Pete's sake, as if they’re headed out for a job interview with Halliburton! Au revoir, Annette! 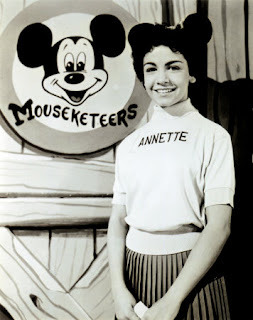 As the Mickey Mousketeer with the prematurely developing bust line, Annette Funicello, you morphed into the most seismic force for male sexual awakening since the invention of masturbation. Though a millennial hearing your name would most likely presume you an Italian desert, I’ll always think of you as the main course to a fantasy that had me glued to a show which was supposed to be about a mouse. Hasta la vista, Howdy! Though your creators should have learned the meaning of the term “no strings attached,” Howdy Doody, you introduced us to an endearing ensemble that foreshadowed the generations-later Sesame Street. Buffalo Bob, Mayor Bluster, the Flub-a-Dub, Princess Winterfall Summerspring, Clarabell, Chief Thunderthud, Heidi Doody, and more …. Hey, thank you, guys! The Peanut Gallery is closed. Happy Trails, Roy! Happy trails to you, Roy Rogers, until we meet again. Happy Trails to you, which will be never, my friend! Our paths diverge, Davy! You may have been King of the Wild Frontier, Davy Crockett, but on the Web Frontier, you’re not even a pawn. With coonskin cap aloft and “Born on a Mountaintop” playing in the breeze, it’s time for you to once again go down swinging --- this time not by the hands of Santa Anna’s men but by the Santa Anna winds of time. Adios, Adlai! You, Adlai Stevenson, were my first political memory. Going with my father to vote for you for President in 1956, we knew you had as much chance to win as to set off a national craze of male babies named “Adlai.” You were beloved by liberals and everyone we knew, but the country liked Ike. Would I get a quick resonating response to your name in 2010? Sadly, think I’d have to wait until hell freezes over. Gotta roam, Lone Ranger! With a "hearty hi-ho, Silver!" and Tonto by your side, you, Lone Ranger, were the oddest of heroes. You started off with a handicap of your own making. You had no secret identity, you needed no mask, and everywhere you went the greeting was the same: "Look, it's an outlaw, kill him!" Your mask was on the side of the law, but it didn't need to be on your face at all! Ciao, Raleigh Coupons! In the 1950’s Cigarette commercials on the air were as prevalent as cigarette smoke in the office. But amongst them all, Raleigh Cigarettes, you puffed supreme. Why? Because of the golf clubs, toasters, and manifold marvels one could obtain “Free for Raleigh Coupons!” The trick, of course, was to stay alive long enough to collect the coupons to get any of them. Cheerio, Cherrios Kid! Along with Annette, my Cheerios Kid, you fueled a childhood fantasy. When you’d eat those “O’s,” you'd acquire a bulging bicep, powered by a colossal Cheerio! I ate your wares diligently, eagerly awaiting the muscle and the mighty “O.” Finally one night in a dream, there emblazoned upon my still spindly arm was a Cheerio indeed --- actual size and soggy from milk. Sayonara, Superman! Many others have played the role, George Reeves, but nobody else ever inhabited it as fully as every 50’s kid once inhabited your cape. The stories were stupid, the production values atrocious, but when you flew, we did too. Greasy hair notwithstanding, you were the Man of Steel. If only Kryptonite had been all that could harm you …. So fare thee well, Fifties! You shall live on in memory and history, if not in my metaphor and simile. Now, I’m off to drop in on the Sixties. I'm a bit nostalgic yet; it's the plight of the Boomer, I think. So for one more time, here's A Further Farewell to the Fifties. I never went to the polls with either parent -- but my guess would be they voted for Eisenhower. How could I ever forget Dobie Gillis? Maynard G. Krebs (proof positive that Bob Denver was funny), Thalia Meninger (Tuesday Weld - Too Hot for the 50's! ), Chatsworth Osborne Jr. and his predecessor, Milton Armitage (played by Warren Beatty! ), and whatever became of Dwayne Hickman? "Hold it! I think you're going to like this picture!" Seems like only yesterday. I wasn't born until '62, but I knew I was getting old when I started having to explain my jokes. The other day I was quoting Jack Benny's line about how it's so difficult to play the violin that you have to practice constantly -- just to be bad. But before telling the joke, I had to explain Benny and his violin! I've found it incredible that so many years have gone by that younger people today --- not just my kids, but even people in their 30's --- don't know icons like Jack Benny, Bob Hope, and even Johnny Carson. I have done the "your money or your life" line or "oh, fella" (pause) "y-e-s-s-s-!" many times to stoney silence. It doesn't seem so long ago that this stuff was in the collective subsconcious of every American! One day today's millenials will be going through the same angst when folks their juniors are saying "Justin who?" Shame we'll probably be with Jack Benny by then and not able to enjoy it! Thank you for following the blog, Mark! I hope you enjoy! Adlai always reminds me that he was McLean Stevenson's cousin .. and then I have to explain who McLean Stevenson was. *sigh* But it isn't just these icons of the 50s that's missing from today's youth - had to explain to a co-worker, who is young enough to be my daughter, why I said "yes MacArthur" when she said upon leaving "I will return". (I know, not quite the quote, but you would have understood the reference.) I was born in '60, but through older siblings ('49, '52 and '53) and reruns, I know all of these references except the Cheerios Kid and Raleigh Coupons, but then again, my dad was a Swisher Sweets man. I was more a Daniel Boone girl ... but I've been told, and seen a picture somewhere, of one of my brothers wearing a coonskin cap. But, I am not saying goodbye to them, people can get over it. I'm forgetting so many things that I take pride in everything I CAN remember. Compensation Professional." I thought it was hilarious until someone told me that half of the audience, even if they knew who Benny was, had no conception of his image as a skinflint. Ouch! For Boomer audiences, of course, it's different. They didn't know who he was then? Ohhhhhhh, I'm feeling olderer and olderer by the minute (when you are ancient, as you know, you can make up words).